There are four levels in the physical: mineral, vegetable, animal and human. The mineral includes solids, gases and liquids. They are all inanimate. They are without any visible movement—neither internal (growth) nor external (location). That is, they stay put (unless moved, or caused to move, by an outside force), and they do not alter their appearance (unless by outside forces). The vegetable shows internal movement—it grows, changes color, etc. Yet it shows no external movement. Plants and trees do not move around on their own. The animal has internal movement as well as external movement. It grows and changes, as well as being mobile. The human has, in addition to all these, communicable intelligence. The human can descend, with difficulty, into animal existence, by acting with no more than raw animal instinct. By failing to use to proper advantage his intelligence capacities, he can become part of the animal world. He can descend (with much greater difficulty, and then only periodically) into vegetable existence. Through sickness or deep sleep, a human can reach a state where his only life signals are his internal movement. At death, the body descends to the level of mineral existence. The animal can likewise descend to vegetable existence or to mineral existence. Each level of existence includes all the properties of the level below it—plus one. Members of each level can descend to a lower level, until the mineral. There is no lower level in our existence than the mineral. Members of one level of physical existence can also ascend to a higher level. Water that has been absorbed into a plant, through its roots, can (and does) become part of the plant. Earth that supports too much growth can eventually lose its nourishment. The minerals have been absorbed by the vegetable existences. Plants also use gases in their growth process. 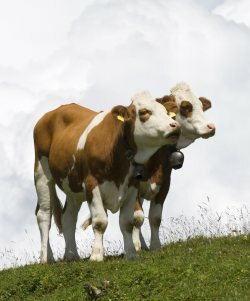 Grass that is eaten by cows gives nourishment, and actually adds pounds of meat, to their bodies. Beef, when consumed by humans, becomes part of the body. Two cows, they were, sharing a paddock on the same farm. It was a delightful little farm set at the foot of a large mountain range. Running through, down from the mountains, was a bubbling brook of fresh water. There were trees spotting the countryside, with a straight row of hedges along the road leading to the farmhouse. And the air was fresh. The farmer was a hard-working man. Always caring for his animals, and plowing and sowing, and weeding and fertilizing, and watering and harvesting. And one day the farmer sold the cows. To a meat wholesaler. At the abattoir, they were separated. The first cow was led to the normal slaughterhouse assembly line. The second cow was put aside. The shochet (ritual slaughterer) was still preparing his knife. There must be no bumps on the blade, not even the smallest nick. It must be a perfectly sharp, specially prepared knife. The second cow was killed. By the shochet. It was opened up. The lungs and other vital organs were checked. Everything is healthy and in order. Within two days, both cows reached their final destinations—as meat. The first cow was bought by a large international hotel. The second, by the local kosher butcher. Many people from many nations complimented the tenderness of the meat, and the skill of the chef, at the destination of the first cow. Many families made many Shabbat meals—the destination of the second cow. So many sightseers were full of energy. The first cow. So many prayers and Torah study groups were full of energy. The second cow. The water from the brook. The fertilizer in the soil. They become part of the grass. The grass in the field. The hay from the haystack. Fresh air from the mountains. They become part of the cows. The cows become part of the humans. Something neutral and harmless. Sightseeing. Something purposeful. In fulfillment of The Purpose. The Development. Studying the divine concept as He communicated it to man. A mitzvah. Torah study. If we had to choose, which cow would we choose to be? High in the mountains on a ski slope. Many people come for skiing vacations. They trample, they slide, they bump and they ski. For sure, the snow has contact with humans. Do they develop it? Does it come in human contact with The purpose? When it melts, in the springtime, it bubbles down the mountainside. In a brook. Through a farm. It waters a green field. Or quenches a thirsty cow. Melted snow helps the second cow grow . . .
Their construction, production and manufacture are specified. The boxes are made of leather. Strips of parchment, made of animal skin, with specified paragraphs from the Torah written on them, are rolled up, tied with animal hair and placed in the boxes. The boxes are sewn closed with animal sinew. Leather straps are fitted through the boxes so that they can be bound to the head and the arm. Boxes of leather. From the second cow. Strips of parchment. From the second cow. Tied with animal hair. From the second cow. Sewn with sinew. From the second cow. Leather straps. From the second cow. Tefillin. From the second cow. A mitzvah. From the second cow. The army fights a fierce battle. To march, to storm and to stomp. And an international traveler, who eats steak and goes sightseeing. Can he develop that which he has eaten (non-kosher meat), the first cow? What if he does a mitzvah with the energy non-kosher meat supplies? There is a little old lady in a small village who has an old cup and saucer placed on a special shelf. She never fails to show it to people who come into her house. “It was a dark night,” she relates, “many, many years ago, when I was young. Our country was in danger of being invaded. The king was on his way back from inspecting the army, when he passed through our village. “It was known that the king, although courageous, was not a very healthy man. And as he passed through our village, he needed something warm to drink. This cup will always be different from her other cups. She had heard of the king before, but had never seen him. Now he had come into her house and asked for a cup of tea. And she had given it to him. In this cup. Through this cup, she has established a relationship with the king. Through a mitzvah, we establish a relationship with G‑d. The object with which we perform the mitzvah becomes different from all other objects. It has fulfilled the wish of G‑d. But we cannot fulfill the wish of G‑d through an object that does not lend itself to such fulfillment. Non-kosher meat is in itself contrary to the wish of G‑d. So how can we attempt to develop meat whose consumption is in direct opposition to G‑d’s wishes?! Even if an international tourist, then, were to visit the sick (a mitzvah) with the energy derived from the meat of the first cow, he does not lend to the development of that meat. The deed is a good deed. A mitzvah. But the meat is not developed. We develop non-kosher food (in one sense), however, by not eating it. The development is the fulfillment of G‑d’s wish with “parts” of our created existence. Just as the king is symbolized by and related to the woman in a special way, through the cup, so is G‑d relating to our created existence, in a special way, through the developed “parts” of the world. G‑d, however, does not exist in time and place. His relating through the developed parts is continuous. A small group of children went out on a hike with their teacher. They stopped on a road, near a farm, at the foot of a large mountain range. Running down from the mountains was a bubbling brook of fresh water. The children drank some water. But first they said a berachah (blessing). They washed their hands (ritually) before their lunch, and again they said a berachah. They sat under a tree. They ate their lunches, and then they said Birkat Hamazon (Grace After Meals). They then studied Torah under the tree. The grass they sat on. The shade of the tree. For over five thousand years, this little farm was waiting for development. They saw two cows as they went. Hi, chanouka sameach to all. I would not be either cow As a vegetarian, I cannot see the death of either cow as being advantageous to the cows, or to people. Consuming meat has health issues, and vegetables are also nourished by the stream, and the ground; A garden can also be a beautiful sight when it is in bloom. I enjoy looking at the cows, and would even like to have one, but not to eat. Almost everything, like army boots, can be made from synthetic sources. I understand the necessity regarding the scrolls and Tefillin but look forward to the day when the Isaiah's prophesies will be realized. "As a vegetarian, I cannot see the death of either cow as being advantageous to the cows, or to people."